HBV produces particles without capsid or genome, termed subviral particles. These particles are produced in much more quantity than the virion (Dane particle), with a ratio going up to 10000/1. Subviral particles protein composition is different from the virion (Heermann et al. fig1 1984 ) Rating=1 (Tolle et al. fig2 1998 ) Rating=1. These two studies do not have the same result concerning filaments and sphere protein composition, presumably because of purification issues. 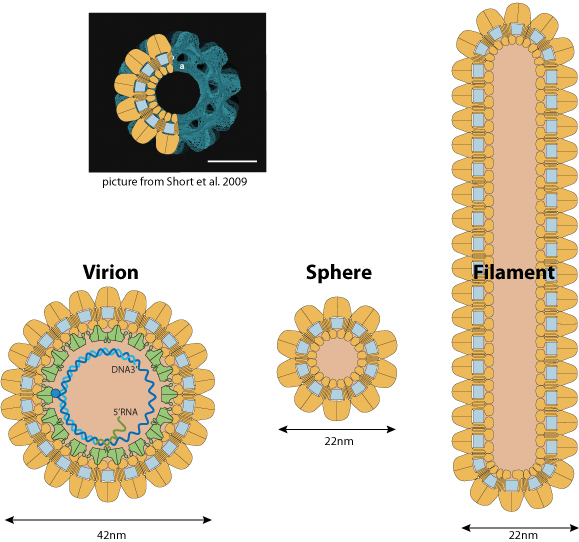 Filaments would have fewer L and M/gp36 than virion, and spheres would be composed by S and M/gp33 without M/gp36 and L.
Subviral particles would be formed in the lumen of ER by self assembly of SHB and MHB proteins forming long filaments. These filaments would be packed into crystal-like structures and being transported to the ER-Golgi intermediate compartment (ERGIC), where they would be unpacked, relaxed and eventually converted into spherical particles. They bud in the ER adjacent to the Golgi region or bile canaliculi (Liou et al. ) Rating=2. The LHB proteins would be retained in the ER because of an ER retention signal (Patient et al. 2007 ) Rating=2. The release of Subviral particles and virion can be inhibited by Antibodies anti S in vivo (Neumann et al.2010 ) Rating=2. The function of subvirals particles are still unknown, but presumably these particles are involved in immune response modulation. It is indeed striking that infected hepatocytes would produce so much SVP without triggering any anti-HBSAg response. The promoter for M/S mRNA would be stronger than that of the L mRNA. That makes sense with the high amount of SVP produced (poor in LHB)compared to virion particles.